"I grew up in Philadelphia in the fifties and sixties so when I began to think about writing a novel, (after writing well over a hundred short stories) it seemed right to set in there and then. I think you have an almost sensate relationship with the time and place you grew up in that you never quite experience again. I know I could walk into my childhood home and identify it by the smell alone. My novel centers on two characters: Eve and Christine Moran, a mother and daughter. Eve is half a generation older than me and Christine more than half a generation younger. I wanted to look at Christine's childhood through my adult eyes rather than fall too much into reliving the years of my own youth. My favorite parts of the book are the ones that lean heavily on the Philadelphia of the sixties and early seventies: what is was like to live in a 750 square foot row house, what is was like to go downtown to shop dressed in white gloves and high heels, how it felt taking a trolley car when they still existed, what working in a glamorous store was like, how closely you were observed in neighborhoods like that. Of course, Concrete Angel is essentially a very dark book so I couldn't allow my memories of a happy childhood to prevail too often. Almost all of the details about Eve and Christine mirror a childhood friend and her mother. Their story was a dark one two and their co-dependency was much like Eve and Christine's. Both are gone now so I had no worry about them reading it. Thanks, Martin, for allowing me to discuss the book's setting here. My next book is set in Detroit, where I have lived since leaving Philadelphia." Continuing my exploration of the work of Patricia Highsmith, I recently re-read Eleven, which I came across originally in the Seventies - it was published in 1970, and is a collection of eleven short stories, with a foreword by Graham Greene. In comparison to her better known work, it's a book that I think does count as a Forgotten Book, but it shouldn't be. I admired it when I first read it, and I was even more impressed the second time around. Greene says, rightly I think, that Highsmith is "a poet of apprehension rather than fear" - in fact he relates this specifically to her novel The Tremor of Forgery, which he greatly admired, and which I discussed a few Fridays ago. He praises her short stories warmly, pointing out - which I hadn't realised before - that some in this book were written even before her first published novel, Strangers on a Train. As he says, "we have no sense that she is learning her craft". He picks out "When the Fleet Was In at Mobile" as his favourite, and it's certainly a poignant story, as well as being as dark as the other ten in the book. Where I might part company with Graham Greene is in his remark that readers may sometimes be able to brush her stories off more easily than her novels, because their brevity means that we haven't lived long enough with them to be totally absorbed. For me, Highsmith is at least as brilliant a short story writer as a novelist. In fact, I'm tempted to say that her gifts were even better suited to the short form. I doubt whether this is a widely shared view, but I think it's no coincidence that, as her career wore on, she struggled to come up with dazzling new ideas for novels - returning to Tom Ripley time and again, for instance, and repeating some themes of earlier books - whereas she continued to write very memorable short stories. For my taste (and judging her by high standards), some of her weaker novels drag a bit. This isn't the case with her short stories.. Certainly, Eleven is full of dazzling, haunting stories. Two feature snails, and one a terrapin, but each is unique and splendid. "The Quest for Blank Claveringi", in particular, is one of the most horrific and gripping stories you could wish to find; it really is a horror story, but it also tells us something about human nature, in Highsmith's customary subtle way. There isn't one story in the eleven that is anything less than excellent. Not so long ago, to suggest that a group of volunteers could set up from scratch a conference about Golden Age fiction that would attract a large and near sell-out audience at one of the country's most prestigious venues would have seemed fanciful. Yet that is exactly what happened with the Bodies from the Library conference at the British Library on Saturday. And the first thing to say about the event is that Mike, John, Mark, Liz, Susan and company who worked so hard to make the dream a reality deserve the utmost praise. The event was a huge success. I was glad to be heavily involved with the day's events. First, Jake Kerridge and I talked about what and when was the Golden Age, and later in the morning Simon Brett and I discussed the Detection Club, including its collaborative books. In the final session, all the participants talked about books they thought ripe for a reprint - I sneaked in several titles, though my ultimate choice was Raymond Postgate's Verdict of Twelve. Simon, witty as ever, suggested that I'd contrived the whole event as a grandiose launch for The Golden Age of Murder, and really it was wonderful to sign so many copies . But there was much else to celebrate. Barry Pike, doyen of Golden Age experts, spoke about Sayers and Allingham, and it was also a great pleasure for me to meet for the first time John Cooper, another great expert, who co-authored with Barry two superb and lavishly illustrated books, Collecting Detective Fiction and Artists in Crime. Both strongly recommended. Other speakers included John Curran on Christie, Dolores Gordon-Smith on Crofts, Tony Medawar on locked room mysteries, and Len Tyler on modern day GA fiction. Along with America's Doug Greene and Marv Lachman, Barry, John and Tony have done so much for so many years to keep the flag flying for GA fiction, and the audience loved listening to them. That wasn't all. Richard Reynolds discussed Oxbridge crime, and we also listened to a John Dickson Carr radio play. David Brawn of Harper Collins and Rob Davies of the BL discussed editing issues with GA fiction; I very much enjoy working with both David and Rob and they were the ideal choices for that particular panel. The social side of these events is always important, and I was delighted to meet a number of people for the first time with whom I've corresponded in the past. In fact, the only snag was that there simply wasn't enough time to have much of a chat with the many interesting people who were there. One thing I can say for sure, though, is that the buzz in the Library was fantastic, and that everyone hopes the event can be held again next year. I've returned home after an exhilarating few days in London, with a number of highlights, including Saturday's superbly organised and hugely successful Bodies from the Library conference. More about that in a day or so, but today I'll focus on an item of news that I've kept under my hat for several months, but which became public knowledge over the week-end. One of the events at the conference saw Simon Brett and I talking about the Detection Club. Simon has been President of the Club for fourteen years, and as he mentioned on Saturday, he made it clear a while ago that he was aiming to retire from office - an office which he has held with much distinction throughout that time. The plan is that he will retire at the next annual dinner of the Club, to be held in November. And the news he announced is that he will be succeeded by.... me. To say that I am thrilled by this is an under-statement. As far as I'm concerned, in the course of an often very fortunate writing career, it really is the greatest highlight, given my undying enthusiasm for the history and heritage of the crime fiction genre, as well as for its present and its future. Back in February, when a number of members approached me with the suggestion that I become President, I was somewhat astonished as well as very flattered. Once I had time to take it in, I was also extremely touched and grateful, and among several lovely things that have happened since the members made their decision is that the great Len Deighton, a member of the Club since 1969, generously took me out for a long and hugely enjoyable lunch in London, an occasion which I shall never forget. The House by the River tends to be remembered today - if at all - as a post-war film directed by the brilliant Fritz Lang. But the film was based on a novel written thirty years earlier by A.P. Herbert, and this is today's Forgotten Book. One thing is for sure: it really does not deserve to be forgotten, since it's very well-written, and in some ways well ahead of its time. This is a novel that is definitely not a whodunit, but a portrait of a murderer. There's a tendency these days for some fans of whodunits to lament the fact that so many crime novels focus on character and setting rather than puzzle. But it's not a new development, as this book illustrates. Herbert focuses on the effect that guilt and moral responsibility for a crime may have on different personalities, and in some ways this novel shows him as a forerunner of the likes of Patricia Highsmith. The main protagonist is a poet called Stephen Byrne, who lives with his wife and young daughter in a house by the Thames. One night, when Mrs Byrne is out, he makes a clumsy pass at their maid, Emily. One thing leads to another, but not in a good way.Stephen strangles Emily, and has to decide whether to confess his crime, or hide it. He chooses the latter course, and enlists the help of his neighbour and friend, a dour but decent civil servant. The pair dump poor Emily's body in the river, but inevitably it is discovered. The twist is that John, the hapless chum, rather than Stephen, becomes the prime suspect. Herbert explores their intertwined fates in a way that would, I feel, have impressed Highsmith. I don't know if she ever read this novel,but it is worthy of her. Yes, that good. The Thames, in particular, is evocatively described, but there are also some very good snapshots of the supporting cast. All in all, a book that ought to be better known. John Norris, that very well-read blogger, is a fan of this novel, and as usual, his judgment is spot on. Cumbria is a large county, and there is more to it than the Lake District. Whilst my series is set in the Lakes, I feel that it wouldn't be realistic to confine the activities of the county's cold case team to the Lakes, and therefore I'm keen to keep an eye on other locations. That, plus idle curiosity, prompted me to visit Barrow-in-Furness on the way back from Carlisle the other day, and in particular to take a look at the islands just off the Furness peninsula. Walney Island is by far the largest of those islands, and it's linked to the docks area of Barrow by a substantial bridge. Many of the houses on the island were originally built for people who worked on the dock, but although there's an industrial (verging on post-industrial) feel to part of the area, there are also two nature reserves and some wonderful views. There's also a great pub at Biggar, The Queen's Arms, where the locals went to some trouble to give me directions to Piel Island. You reach Piel via Roa Island, which is itself accessed by a causeway from the mainland. At the end of Piel Street, there is a huge lifeboat station, and a long jetty for the ferry to Piel. Piel was given to the people of Barrrow after the First World War, and the ferryman was none other than Steve, the King of Piel. Piel has a marvellous history. The monks of Furness Abbey built what is now known as Piel Castle (not to be confused with Peel Castle on the Isle of Man) and it's in the care of English Heritage. The ruins are extremely impressive. We were stranded on the island for a couple of house, because of the tides, but this was no hardship. It's pleasant to walk around the ruins, to admire the views, and to sample the hospitality of the Ship Inn. I've wanted to take a look at Silloth for a long time. It's a proposed trip I discussed some years ago with Maxine Clarke- many blog readers will remember Maxine fondly for her Petrona blog. Maxine was a lovely person, who knew Silloth very well, and recommended me to go there. It's a little resort on the Solway coast, and it appealed to me in the way that old resorts usually do. As a bonus, you can look across the water and see the Scottish coast, not that far away. Whilst I was there, I thought back to my all too infrequent get togethers with Maxine, who died far too young. She is much missed. Something unexpected happened whilst I was at Silloth. I'd been playing around with an idea for a historical story, and that was in my mind when I set off up the motorway. But whilst I was wandering along the promenade, an idea came to me - unbidden - about a new mystery involving Daniel Kind. This particular puzzle strikes me as a very suitable sub-plot for the next Lake District Mystery. I've returned from attending the inaugural Carlisle Crime Writing Festival - a thoroughly enjoyable week-end, for all sorts of reasons. The Festival was the brainchild of Martin Daley, an author of historical crime fiction, and the Festival had the backing of Carlisle Borough Council. Now, local authorities come in for their fair share of criticism, but the first thing to say is that I believe this was a very well-organised and successful venture, the first step, perhaps, on the journey of putting Carlisle on the crime fiction map. I do hope the festival becomes a fixture in the calendar, because the city is a terrific destination, the gateway to Scotland if one is heading north, and to the Lake District if heading south. One of the spin-off benefits of a successful festival is that local businesses benefit, and among those that certainly deserve to benefit is the local bookshop, Bookends (which also has a branch in Keswick.) In addition, the owners run a second hand bookshop, Bookcase, which has extensive and impressive stock and is also well worth a visit. A word, too, for the Crown and Mitre Hotel, where we stayed and were well looked after. On Thursday evening I had a chance to catch up over dinner with Rebecca Tope, with whom I shared a platform on Friday morning, along with a newish author, Graham Smith. The connecting theme was that we all write books set in the local area, although we have contrasting approaches to writing and our books are quite different. Martin Daley hosted this session, and did so very professionally. In the afternoon, as well as looking around the city, and the cathedral, and visiting Bookcase, I enjoyed a panel featuring the Scottish trio Lin Anderson, Alex Gray, and Alanna Knight. 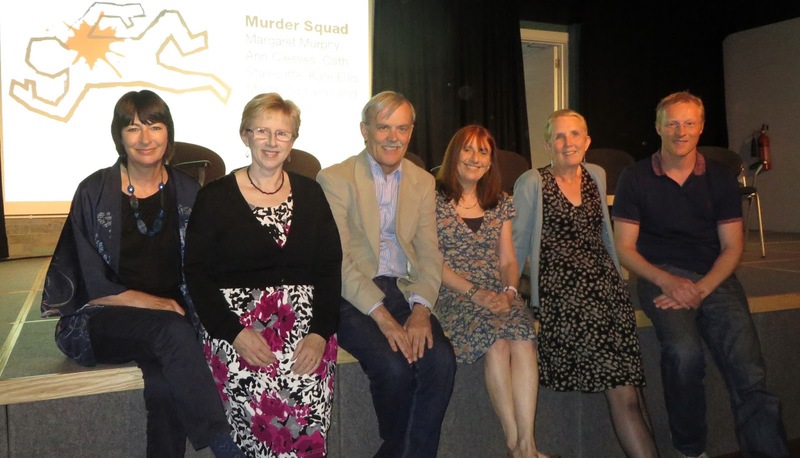 Then it was time for the evening event - a rare outing together for all six members of Murder Squad. This was a fun session, ably organised by Cath Staincliffe, and it's fascinating to think that the Squad has been together, with only limited changes of personnel, for close on sixteen years. And we are all still speaking to each other...in fact there was much convivial conversation over dinner afterwards. All in all, a great event, and special thanks go to Martin and his team for all their hard work. Getting a festival like this off the ground is far from easy, but they did great job. As for me, I had a fantastic trip, with excursions to other parts of Cumbria before and after the festival. And I even met a real life King. More about this shortly! . Does anybody remember Cluff? This was a detective show on the BBC in the mid-Sixties. I have a vague recollection, but no more, of seeing it when I was young. Apparently the TV series sprang from a pilot episode of that wonderful anthology series Detective - but my memories of Detective really go back to the later shows, screened right at the end of the Sixties. Anyway, I've just read the first book featuring Sergeant Cluff, who was played on TV by Leslie Sands. And Sergeant Cluff Stands Firm is definitely a Forgotten Book that deserves to be read today. The setting is Gunnarshaw, which is a thinly disguised version of Skipton. The author of the Cluff books,Gil North - whose real name was Geoffrey Horne - was born and grew up in Skipton, and spent his later years there after a long career in the British Colonial Service. Cluff is gruff and bluff, a typical taciturn Yorkshireman, but beneath the stubborn and uncompromising exterior lurks a man with genuine compassion, and a burning desire to see justice done. In this story, which appeared in 1960, and was the first of eleven Cluff books, Cluff is determined to do justice on behalf of a middle-aged woman who is found gassed in her own bedroom. The obvious conclusion is that she has committed suicide, but Cluff distrusts obvious conclusions, and he determines to find out what has led Amy Wright to such a dreadful end. The setting is strong, and so is the characterisation. Cluff is a sort of Geoffrey Boycott of detection - cussed and sometimes irritating, but gifted, and reliable in a crisis. There are strong hints of the Maigret books, and although Gil North wasn't anything like as prolific as Simenon, and had a literary style that was, perhaps, an acquired taste (Harry Keating, for instance, wasn't too keen on it) he could certainly write well. This is a short book, but it packs a punch. End of the Game is a 1975 film that is known under various names, including the original German title, Der Richter and sein Henker (The Judge and his Hangman.) It's based on a book published 25 years earlier, written by the Swiss playwright and novelist Friedrich Durrenmatt. When I was studying for my A Levels and S Levels in German, at the tender age of 17, I read Durrenmatt's famous play, The Visit, which I thought was superb. This prompted me to seek out his other work, including Der Richter und sein Henker, a detective story. I really enjoyed it - and not just because it was short and pretty easy to read in the original German! One very pleasing feature of the film is that Durrenmatt himself makes an appearance - as a writer called Friedrich. We encounter him, musing over a chess game. When asked what he is doing, he says, "I am playing myself." The double meaning is a typical Durrenmatt joke - his specialism was not detection, but comedy, usually with an ironic edge. This is a stylised film, by no means wholly realistic, but none the worse for that. The mystery element is not at all bad - the complications are piled on rather cleverly, thus blinding the viewer to what is, in truth, an obvious solution to the whodunit question. The cast is very good, and the soundtrack is provided by that wonderful composer Ennio Morricone. I was glad to be reminded of Durrenmatt's excellence. Recommended. The republication of classic crime novels continues apace with two rather different, attractively produced new series. The first comes from Harper Collins, who are starting to reissue the books of Edmund Crispin in paperback. Three titles have recently appeared: Love Lies Bleeding, The Moving Toyshop, and Holy Disorders. Each book features Crispin's amateur sleuth Gervase Fen, and my understanding is that the rest of Crispin's books are likely to appear in similar editions in due course. Crispin was influenced by the likes of fellow Oxford man, Michael Innes, and John Dickson Carr. His work has always retained an appeal to readers; I recall listening to a very enthusiastic discussion of his work by Susan Moody a while back, which revived my interest in his work. So his books have never been too hard to find; all the same, it's good to see these new editions. Here's my take on The Moving Toyshop. Alexander Wilson, in contrast, really is a forgotten writer. But perhaps not for much longer. Allison & Busby have set about reprinting his thrillers, with cover artwork in a style eerily reminiscent of the British Library Crime Classics series (though where are the wonderful introductions? Only joking!) Wilson was a spy as well as a writer, and there's a very interesting Wikipedia page about him. The first three titles to appear are: Mystery of Tunnel 51, The Devil's Cocktail, and Wallace of the Secret Service. I first picked up a copy of today's Forgotten Book when I was a student, going through a Patricia Highsmith phase. Unfortunately, I only managed about fifty pages of The Tremor of Forgery before giving up. Later, I acquired a Penguin paperback of the same title, but only now have I got round to reading it. This time, I made my way to the end of the story, and I'm glad I persevered with it. Opinions are divided on Patricia Highsmith and her books; but I do find that there is something hypnotic about her writing. Graham Greene and Julian Symons, no mean judges, thought that The Tremor of Forgery was perhaps her best book, but others will struggle with it, as I did first time round. For me, it doesn't compare to Strangers on a Train or The Talented Mr Ripley. I'm not even sure it's right to describe it as a crime novel; that isn't a label that the author herself applied to it. It is, strange to say, a book in which not very much happens. An American writer called Howard Ingham is visiting Tunis - the idea is that he will work on a film with an acquaintance, who has yet to turn up. The Tunisian setting is unusual, and as with so many Highsmith books, the wonderfully evoked exotic location contributes greatly to the pleasure of the story, as well as somehow helping to make plausible behaviour that might otherwise seem highly unlikely. Ingham becomes anxious, as well as lonely bored, when he doesn't hear from his acquaintance, or from Ina, the woman he plans - in a vague sort of way - to marry. He befriends an American right-wing broadcaster (there's quite a lot about politics in the book, which provides a mildly interesting historical context) and a gay Dane. Ingham rebuffs the Dane's advances, yet remains strangely drawn to him.There's a strong gay sub-text to several of the scenes. An incident occurs which may or may not amount to murder. Ingham's conscience is sorely troubled, but (spoiler alert!) we never know for sure what happened to the victim. And that's about as action-packed as the story gets. It's an odd, low-key book, best read for the sinuous prose rather than the almost non-existent plot. On the back of my Penguin, a reviewer comments that he'd rather read Highsmith's worst book than anyone else's best. The cynic in me wondered if the preceding sentence suggested this was indeed her worst book! I don't think it is, but it definitely won't be everyone's cup of tea. Agatha Christie she wasn't, but she was an extremely interesting and intelligent writer..
"I spent my childhood summers in the wonderful, small, northern-most town of Siglufjörður in Iceland, where the days are long and bright in summer (but equally short and dark in winter). When I started writing crime fiction, I felt compelled to write a book set in this place. The village, nestled by the fjord, is closed off on every side by high mountains and the only way to get there is by tunnel or by sea. I always felt it was a very fitting setting for a crime novel, a sort-of locked room in the shape of a small town. It’s not unusual for avalanches and heavy snowfall to close off the roads and, indeed, any access, into town in winter (which, of course, happens in the book as well). I also had more personal reasons for writing about Siglufjörður. My father grew up there, during the era when the town was the bustling centre of herring fishing in Iceland, where people worked day and night to bring the fish in from the sea. My grandparents lived there for most of their lives, and my grandfather wrote a series of books about the history of Siglufjörður. I have been a fan of Golden Age crime fiction for years; I started by reading, and later translating, Agatha Christie, and also enjoying books by a variety of other authors of that era, such as Queen, Van Dine and Marsh. The factors that drew me to Christie – and the Golden Age in particular – are, to a large extent, her plotting and use of setting, and I wanted to try to create a story that could in some way be a juxtaposition of the Golden Age and the much newer Nordic Noir. That, too, is a genre that has influenced me, and I have many favorite authors, including Stieg Larsson and Jo Nesbo. Another influence is the amazing P.D. James, whose characterization is second to none. I really admire the way she created memorable characters with complex backgrounds, all of whom stay with the reader long after the story is finished. In Snowblind, I set out to create a small gallery of suspects, all of whom have back stories that are revealed – little by little. We see the story evolve in part through their eyes, as well as through the eyes of the lead detective, Ari Thor. In addition to the above, a key factor behind my decision to write Snowblind was also – of course – the fact that I felt I had a story to tell; the story of a group of people living in a remote place, the story of a young man adapting (or not adapting!) to a new and fairly hostile environment, and little plot twist that I hope I’ll manage to conceal until the very last pages." I particularly like Ragnar's point about combining GA type writing and Nordic Noir!. One of the sub-plots, so to speak, of The Golden Age of Murder concerns the stories that are evident, or implicit, in some of the inscriptions by authors in their Golden Age whodunits. This is a subject that has intrigued me for a number of years, and in the book,I've discussed inscriptions by Agatha Christie, Henry Wade, and others that I find appealing. But of course, it is rather hard to track down such books. I succumbed to temptation, therefore, when down in London on Friday..For the first time,two major book fairs, one run by the PBFA, the other a major international event, were run in tandem, with a shuttle bus linking the two events. I met up with a couple of friends, including the doyen of Golden Age commentators, Barry Pike, and set about haunting the bookstalls. My haul was more modest, but I was very pleased with it nonetheless, and I did find some very interesting inscriptions. One example is to be found in a copy of Robert Player's first book, The Ingenious Mr Stone, and another in John Dickson Carr's Fire, Burn! - Carr often wrote lengthy inscriptions, and this is a good one, though not easy to read! The Evelyn Elder novel in the picture above is not inscribed, but it was such a lovely copy that I couldn't resist it, knowing that I'm never likely to see another. I'll be talking more about the inscribed books on another occasion, but suffice to say that it was a thoroughly satisfying pair of events. And it was rounded off by most enjoyable dinner with Barry Pike and a notable collector, my friend and fellow employment lawyer Nigel Moss. Barry has, by the way, already written his talk on Allingham and Sayers for the Bodies from the Library conference on 20 June, and I'm sure fans of those two writers would love to hear it. Book now while a few tickets remain available - the event is expected to sell out.